The beautiful seaside town of Aldeburgh is one which has inspired many an artist, musician and traveller. With bright, colourful properties on the seafront and a steel sculptured tribute to Benjamin Britten on the shingle shore, Aldeburgh is perfect for a picturesque stroll along the beach. The High Street boasts a wide selection of boutiques, eateries, art galleries and a cinema to name but a few places which may take your fancy and with an award winning fish and chip shop, what better place to stay? We have a vast array of holiday homes in Aldeburgh itself as well as the surrounding area; by the sea and in the countryside. Click the 'read more' tab for a brief overview of some of the surrounding towns and villages, or for more detailed information visit our Aldeburgh Area Tourist Guide. Barely ten minutes away from Aldeburgh is the village of Snape, home to Snape Maltings with a range of eateries, shops and galleries. The composer Benjamin Britten spent many of his years here before moving to Aldeburgh itself, his music inspired by the great landscapes and the people of the area. The Aldeburgh Festival brings people to Snape from all over the country as acclaimed musicians from all walks of life perform in the renowned concert halls of the Maltings. A tad further north of Aldeburgh lies the fascinating village of Thorpeness. Thorpeness began life as a hamlet, then in 1910 a rich, Scottish barrister decided to transform it into a fantastical holiday village where the illustrious and wealthy would visit from their London homes. He created a vast boating lake inspired by his friend’s novel Peter Pan and tourists now revel in the chance to row around the islands of the Meare on a warm, sunny day. 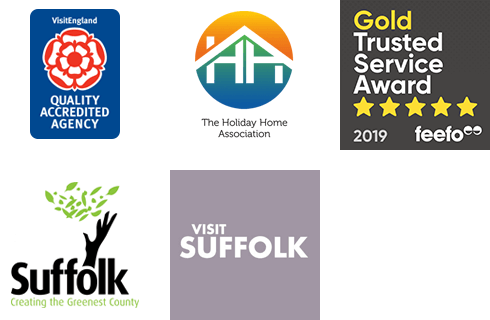 Take a little time to browse through our selection of holiday cottages in Aldeburgh and the surrounding area. We’re certain you’ll find something just right for a truly special Suffolk holiday. The Sail Loft is a fantastic self catering apartment located on the high street in Aldeburgh and only a stones throw from the beach. Special Offer! 10% Off remaining dates in April at this lovely little Bolt Hole! Directly on the seafront in the popular coastal town of Aldeburgh is Shoreline. The perfect holiday hideaway for a romantic couple's retreat.